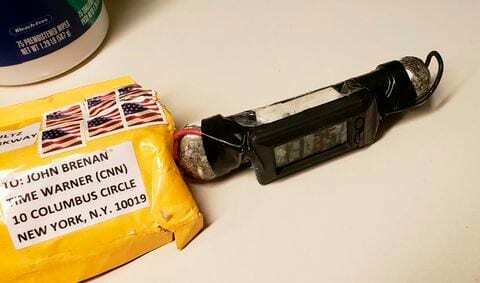 A series of crude explosive devices sent through the mail to top Democrats, critics of President Trump, and CNN has put the entire nation on edge. Thankfully, none of these makeshift explosives have detonated, so no one has been hurt so far. Law enforcement is treating the investigation as a domestic terror matter. On Monday, October 22, a suspicious package targeting billionaire and philanthropist George Soros was rendered safe by law enforcement in Bedford, New York. The next day, a package containing a possible explosive device intended for Hillary Clinton was intercepted. On Wednesday, former US Attorney General Eric Holder and President Obama were targeted. A suspicious package was also found inside CNN’s New York Bureau in the Time Warner center in New York, which was quickly evacuated. Law enforcement officials said that package was addressed to former CIA director John Brennan, who has appeared on CNN before. According to CNN, “A suspicious package addressed to the Washington office of US Rep. Maxine Waters, D-California, was intercepted at a congressional mail-screening facility in Maryland, and a second package addressed to the congresswoman was found at a postal facility in Los Angeles. It matches the description of those sent to the other officials.” On Thursday, Joe Biden and actor-director Robert de Niro were targeted. Most of the intercepted packages had the return address of US Rep. Debbie Wasserman Schultz (D-Florida), with her last name misspelled. Due to some errors with the addresses on the to-be explosive packages, some were returned to her. There is no evidence that suggests she sent the packages. Explosives experts say that bombs were most likely sent just to create widespread panic. “The devices had suspicious-looking packaging, and at least one had a timer that can be bought for a few dollars online and should be easily detected when mailed or delivered,” CNN reports.